Pleasure: The state — or feeling — of being pleased, gratified, delighted. A source of enjoyment. Sensual gratification. What’s “your” pleasure? 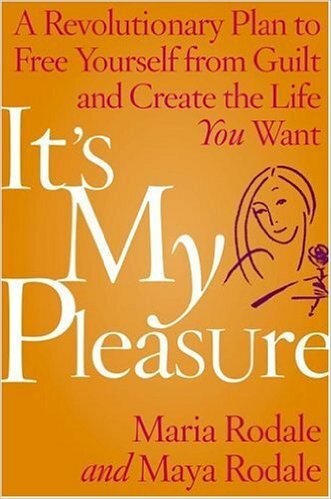 However you define it, pleasure is vital to every woman’s life — to your life — especially in today’s hard-driving, hard-working society. Yet most women have lost sight of their vital need for pleasure, and feel guilty for taking even ten minutes for themselves — they don’t want to seem self-indulgent, or they can’t afford the time, or they’re too busy taking care of other people instead of themselves. For your own sake — and ultimately for your loved ones — it’s high time you dropped the guilt and took back “your” pleasure. In “It’s My Pleasure,” Maria Rodale, the dynamic leader of a powerful lifestyle corporation who successfully revolutionized her own business, and Maya Rodale, her talented writer-daughter, show you how to create a pleasure revolution in your own life — to stop hiding your pleasure and incorporate it fully into everything you do, no matter what your age, situation, or religious background. In the Rodales’ exciting vision of every woman’s potential, pleasure is not a simple, momentary experience to be segregated into a few minutes a day. It’s endemic to women’s bodies, minds, and experiences on Earth. And it’s essential for your health and success. Drawing from their years of research into women’s history — including the suppressed ancient Goddess religions — as well as the latest scientific findings, the Rodales prove that, for women, pleasure is the path to freedom, happiness, and self-fulfillment. To show us the myriad ways to find satisfaction and become the heroines of our own lives, theyconduct lively interviews with “Pleasure Revolutionaries” including scientist Helen Fisher, historian Riane Eisler, writers Julia Quinn and Ruth Reichl, and gourmet pioneer Alice Waters. They also profile inspiring heroines from history — adventurous, colorful women from all over the world and all walks of life — from the fictional Nancy Drew and Dagny Taggart and powerful mythic figures such as Inanna and Mary Magdalene to popular artists Georgia O’Keeffe and Madonna, romance novelists George Sand and Nora Roberts, and activist Victoria Woodhull, who was the first woman to run for president. These Pleasure Revolutionaries also prove that change, self-discovery, and self-improvement don’t have to involve suffering. Synthesizing their findings into a practical, affirming philosophy, the Rodales spice it with their own experiences, fun tips, and lists, and fuse it into appealing, realistic guidance for life, love, friendship, and romance. “It’s My Pleasure” celebrates women’s voices, insights, and experiences in a format that any woman can use to take action, create positive change, meet the highs and lows of a demanding world, and develop confidence, optimism…and lasting pleasure.